A stomach ulcer, also known as a gastric ulcer, is a sore or lesion that develops in the lining of the stomach. It can also occur in the upper part of the intestine. According to the American Gastroenterological Association, about four million people have stomach ulcers and one in every 10 people suffers from an ulcer at least once during their lifetime. Stomach ulcers occur when the lining of the stomach or upper intestine gets irritated by the harmful effects of stomach acid. This can happen due to several factors like by an infection with the bacterium Helicobacter pylori (H. pylori), excessive use of nonsteroidal anti-inflammatory drugs (NSAIDs), drinking too much alcohol, radiation therapy, burns and physical injury. The most common symptom of a stomach ulcer is a burning sensation or pain in the area between your chest and belly button. The pain can last for a few minutes to several hours, depending on the severity of the ulcer. Other symptoms include poor appetite, bloating, heartburn, indigestion, belching, nausea, vomiting and weight loss. People of any age can get stomach ulcers and women are affected as frequently as men. It must be treated immediately or else the ulcer can get worse. Fortunately, there are several natural remedies that you can easily use at home. Home remedies usually focus on strengthening and protecting the stomach lining against acids. Before using the home remedies though, consult a doctor to ensure long-term relief. 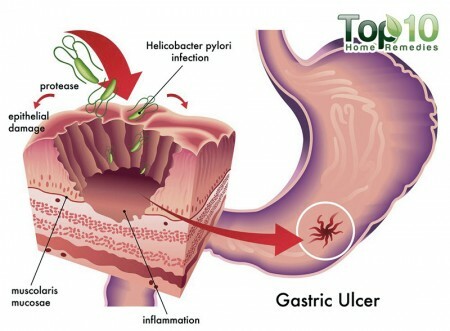 Here are the top 10 home remedies for stomach ulcers. 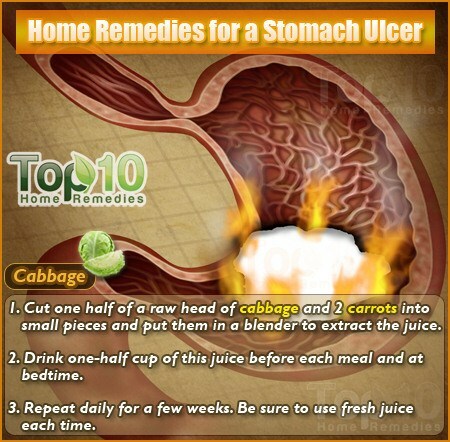 Cabbage is a great remedy for a stomach ulcer. Being a lactic acid food, cabbage helps produce an amino acid that stimulates blood flow to the stomach lining. This in turn helps strengthen the stomach lining and heal the ulcer. Plus, cabbage contains a good amount of vitamin C, which has been found to be particularly beneficial for patients with H. pylori infections. Also, experiments indicate that fresh carrot juice contains an anti-peptic ulcer factor (vitamin U). Cut one half of a raw head of cabbage and two carrots into small pieces and put them in a blender to extract the juice. Drink one-half cup of this juice before each meal and at bedtime. Repeat daily for a few weeks. Be sure to use fresh juice each time. For stomach ulcer treatment, both ripe and unripe bananas are very effective. There are certain antibacterial compounds in bananas that inhibit the growth of ulcer-causing H. pylori. Bananas also protect the system by wiping out the acidity of gastric juices. This helps reduce inflammation and also strengthens the stomach lining. To treat an ulcer, eat at least three ripe bananas a day. If you do not like eating bananas, you can make banana milkshakes. Alternatively, peel two or three bananas and cut them into thin slices. Put the slices in the sun until they become dry. Grind the dried banana pieces into a fine powder. Mix together two tablespoons of this powder and one tablespoon of honey. Take this mixture three times a day for about a week. Surprisingly, cayenne pepper is another very effective remedy for treating stomach ulcers. According to a review published in Critical Reviews in Food Science and Nutrition, the compound capsaicin present in cayenne pepper inhibits the secretion of stomach acids, boosts the production of alkali, and stimulates mucus secretions and gastric mucosal blood flow, thereby preventing and healing ulcers. Mix one-eighth teaspoon of cayenne pepper in a glass of warm water. Drink it twice a day for the first two to three days. Gradually increase the amount of cayenne pepper up to one-quarter-teaspoon twice daily for the rest of the week. Alternatively, take cayenne capsules that you can buy at health food stores. Take three capsules a day immediately after meals for one week. You can also add a pinch of cayenne pepper to soups, meats and other savory dishes. Coconut is very good for people suffering from stomach ulcers because of its antibacterial qualities. It kills the bacteria that cause ulcers. Moreover, coconut milk and coconut water have anti-ulcer properties. Drink a few cups of fresh coconut milk or tender coconut water daily. Also, eat the kernel of the tender coconut. Follow this treatment for at least one week to get positive results. Alternatively, take one tablespoon of coconut oil in the morning and another at night for one week. As coconut oil is mainly composed of medium-chain fatty acids, it can be easily digested. Several studies suggest that licorice works effectively for treating and preventing stomach ulcers. It helps the stomach and intestines produce more protective mucus that forms a coating over the stomach lining. This in turn eases the pain from ulcers and speeds up the healing process. Mix one-half teaspoon of licorice root powder in one cup of water. Cover it and let it sit overnight. The next morning, add one cup of cooked broken white rice (a grade of rice consisting of grains broken during the milling process) into this infusion and eat it. Repeat daily for one week to get positive results. Another option is to drink licorice tea two or three times a day for one week. Alternatively, you can chew and then swallow two or three deglycyrrhizinated licorice (DGL) tablets three times a day for about a week. You can easily find these 380 mg tablets in health food stores. Fenugreek is known for its powerful healing properties and health benefits. You can use it to treat stomach ulcers also. Being rich in a mucilaginous compound, fenugreek protects the stomach’s lining by coating it like mucus, thereby facilitating the process of healing. Boil one teaspoon of fenugreek seeds in two cups of water. Strain and drink it after adding a little honey to it. Another option is to consume one teaspoon of fenugreek seed powder along with milk. Alternatively, you can boil one cup of fenugreek leaves, add a little honey, and eat it twice a day. Follow any of these remedies twice daily for about a week. 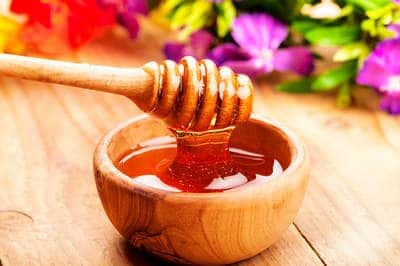 Raw honey has potent healing properties that help a lot in the treatment of stomach ulcers. An enzyme called glucose oxidase in honey produces hydrogen peroxide, which in turn kills harmful bacteria that cause ulcers. Plus, it soothes and reduces the inflammation of the stomach lining. Take two tablespoons of raw honey daily, early in the morning on an empty stomach. It will help cleanse the bowel, strengthen the stomach lining, and prevent and treat stomach ulcers. Garlic also helps treat stomach ulcers. Researchers at the Fred Hutchinson Cancer Research Center in Seattle discovered that the antibacterial and antimicrobial properties of garlic can keep levels of the Helicobacter pylori (H. pylori) bacterium in check, which contribute to the development of stomach ulcers. 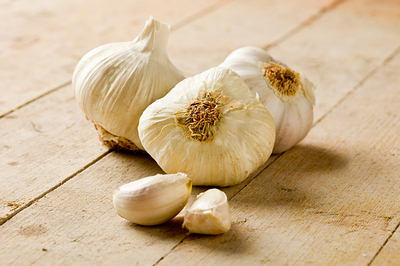 Simply take two to three crushed garlic cloves followed by a glass of water during the day. Do this on a daily basis to ease inflammation in the stomach and prevent stomach ulcers. Slippery elm is another good remedy for stomach ulcers. 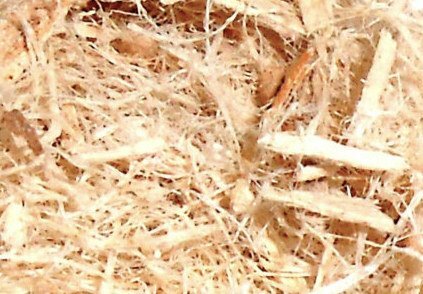 The inner bark of the slippery elm contains a good amount of mucilage that soothes and calms inflammation and pain. Plus, the mucilage helps remove excess fats in the intestines. Take the inner bark of the slippery elm and grind it into a powder. Mix one teaspoon of this powder in one cup of warm water. Drink this mixture three times a day for one week. 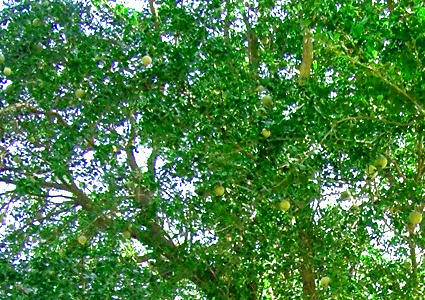 Leaves of wood apple, also known as bael, is also very useful in the treatment of stomach ulcers. The tannins present in the leaves help protect the stomach against damage from secretion of excess acid. Juice extracted from wood apple fruit also helps reduce pain and inflammation due to its mucilage content. Soak two to three wood apple leaves in one cup of water in a copper vessel overnight. The next morning, strain the mixture and drink it on an empty stomach. Follow this treatment daily for a few weeks. For mild to moderate stomach ulcers, these remedies will give you positive results within one week. However, if you suffer from acute stomach ulcers, it is highly recommended to consult your physician.